Bob helped with the constructions on many parades and has carried the banner in a parade. Cooked Hamburgers and Hot Dogs for the beach parties. He is always there if the Shag Club needs anything. 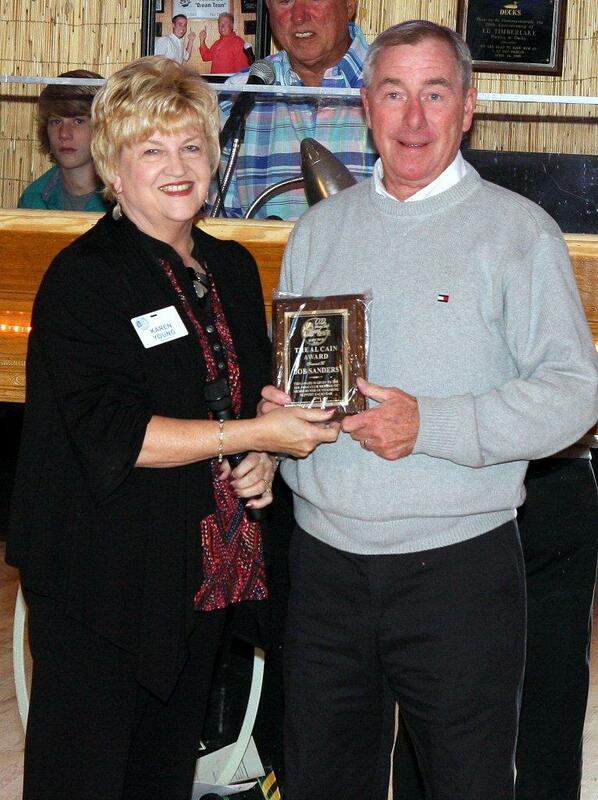 I want to take this opportunity to thank each of the Board Members for awarding me the 2014 Al Cain Award. I am honored and very happy to receive this most prestigious OD Shag Club recognition. When you presented it to me at the Thanksgiving Party, I was so surprised and completely at a loss for words! I enjoy every minute of my membership in the OD Shag Club. I’M grateful for the opportunities I’ve had to contribute to our Club. The OD Shag Club is very important to me and I am extremely appreciative of receiving this award. I hope everyone had a great Christmas and New Year’s with family and friends. It’s hard to believe a new year has begun and what a year it will be. We are planning to have a wonderful 2015 with fun parties, good friends, lots of laughs and may we all dance!!! Thanks so much to Karen Young, the 2014 Officers, Board Members, Committee Chairs and all the Worker Bees, for a terrific year. I would also like to thank Karen for working so hard to help me prepare to be your President this year. Our first Party will be our Brunch during the Mid-Winter / Winter Workshop on Sunday January 18th, 10am at the OD Arcade and Lounge. Chris and his crew will be hard at work to assure a good time is had by all. Please remember to thank them when you get a chance. “The World Famous Oyster Roast” on February 21st at 6pm and will also be at the OD Arcade and Lounge. We will have chicken bog for those of you that do not eat oysters. This is a huge process and to make it look easy, Donnie Schultz will need many worker bees for a variety of duties. Please contact him if you are able to volunteer your time. The Luck of the Irish Party will be on March 21st, 6pm at Fat Harold’s Beach Club. Bring your best side dish or dessert (doesn’t have to be Irish) for members to enjoy and the Club will be providing the Beef!! When bringing food, we ask that you please arrive early (by 5:30) to allow time to arrange table setting. Everyone is invited and encouraged to attend the Board Meetings on the first Tuesday of every month. I look forward to hearing ideas and appreciate any and all participation from our ODSC Members. I’m excited to serve as your President as well as working with the Board to give you a great year!! Thank you all from the bottom of my heart for coming to make the night enjoyable for our patients. They will be talking about “The Dancers” for months. What a great thing to bring some fun and excitement into their lives. Thanks again. The gifts and food for the needy families were sorted and loaded on the trailer by the following volunteers: Wendy Schultz, Monica and Billy Powell, Tina Tomberlin, Rich and Karen Young, Peggy Christie, Bill Bacon and Susan and Kevin Harrell on Sunday morning. Monday morning Wendy Schultz, Tina Tomberlin, Peggy Christie, Bill Bacon and Rich and Karen Young delivered the items to Riverside Elementary and Ocean Drive Elementary. Thanks to all those that helped sort and deliver and to all the members who brought food to the party. Your generosity will make Christmas a lot brighter for these 4 families. It was a beautiful day for a Parade, well that is until we got on Main St. The rain did hold out long enough for everyone to decorate, take pictures and share lots of love and laughs with friends prior to the parade starting. The golf carts where decorated with lights, garland and ornaments, everyone was dressed in all their Christmas attire. That Whoville group was a hoot and very entertaining with The Grinch and his dog Max!! The kids went wild!! A big thanks goes to Paul Harrison (ODSC Past President 2005) for helping me carry the Banner and get all the windshield flyers on the carts. Donnie and his worker bees did another great job making sure all the candy was given out. We had 16 golf carts and 8 walkers, with a total of 66 people. Thanks to all that participated. Thank you OD Shag Club, not bad for a rainy night!! Lastly, I have enjoyed being Parade Chair since 2009 and we made some wonderful memories. Your new Parade Chair for 2015 will be Billy Powell. He and his wife, Monica (Vice President 2015) were involved with the Monroe Shag Club as Parade Chair for years and will do a fantastic job. Thanks for a great ride!! Well, December has arrived and it heralds my last letter as OD Shag Club President for 2014. It has been both a challenging and a rewarding year. I want to thank all my board members and committee chairpersons for their support the past year. Our first event this month is our visit to Myrtle Beach Manor to entertain the residents on Monday, December 8th from 6-8 PM. Members are welcome to join us and help us put smiles on the faces of the residents. This is an annual event and members who have participated have found it very rewarding. Our OD Shag Club Christmas Party is Saturday, December 13th at 6 PM at Fat Harold’s Beach Club. The meal is being catered by T-Bonz. The Club is sponsoring 4 families with a total of 13 children this year for Christmas. We will be collecting non-perishable food items for these families at the party. Please make sure these items do not have expired dates. Let’s make sure they have a wonderful Christmas this year. We will also be putting up for silent auction a framed limited edition print by Vic Gillespie. It is number 58 of 500. Minimum bid is $75 and bids will be in $5 increments. This would make a wonderful Christmas present for someone. Bring cash or your checkbook so you can bid on it. Please give your 2015 President, Wendy Schultz, and her board your support next year. A club is only as good as the members who put forth an effort to make it so. Get involved and make new friends. You will not regret it! I wish you all a very Merry Christmas and may the New Year bring you only joy!